Despite being located in California, San Francisco has little in common with the rest of the Golden State when it comes to its climate. Summers in San Francisco should not be called summers. Can we all agree on a different name, please? What do you call a foggy, overcast and cool season? Fall? Oddly enough, fall in San Francisco is the best time of year and warm and sunny weather is expected to last until early November. No pumpkin-spiced anything for us, at least until then. To make the most of San Francisco's best season, I’m making plenty of ice cream. I managed to get my little Tea Squirrel paws on some locally grown passion fruits. 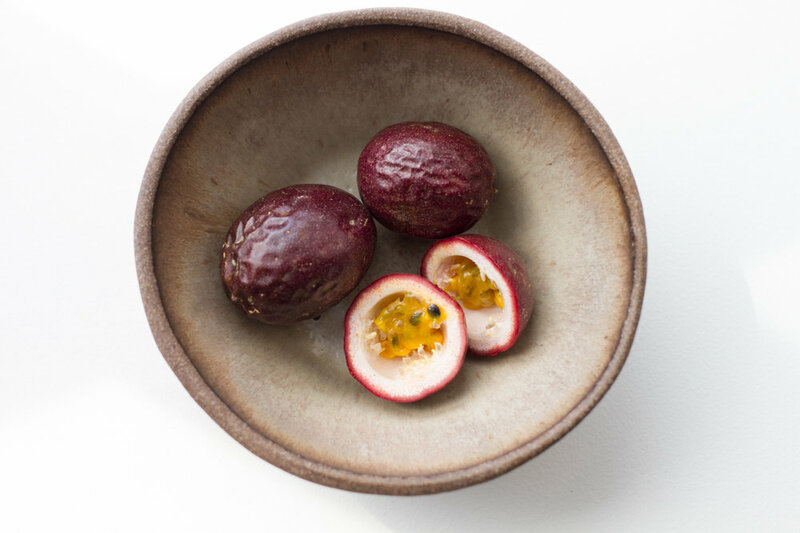 If you thought homegrown passion fruit only grew in Hawaii (my beloved lilikoi), you were not alone, because I didn’t know it grows beautifully in California either! The best way to pair any ice cream with tea? Affogato, of course! Affogato is a popular dessert in Italy and is traditionally made with coffee. A scoop of gelato is "drowned" in a shot of espresso. I’ve experimented with this dessert before, do you remember my Matcha affogato? Well, I think passion fruit ice cream pairs beautifully with oolong tea! In this picture, I used cold brewed Phoenix Mountain oolong (honey orchid fragrance), hence the lighter color of the brew. Cut passion fruits in half and scoop out the pulp into a strainer. Press on the seeds and pulp with the back of a spoon to extract as much juice as possible. Separately, whisk together sugar and eggs. Heat cream until it just reaches a boil, then slowly add hot cream to egg mixture, whisking. Pour mixture into saucepan. Cook over low heat, stirring constantly, until it reaches 170°F (do not let boil). Pour through a sieve into a clean bowl and cool completely. Stir in passion fruit pulp, then chill, covered, until cold. Freeze in ice cream maker. Transfer to an airtight container and put in the freezer for at least a couple of hours before serving. Steep the tea, let cool to room temperature or cold brew it overnight if you prefer. Place a scoop of passion fruit ice cream in a serving bowl, pour tea on top and enjoy! Ice cream recipe adapted from Epicurious.